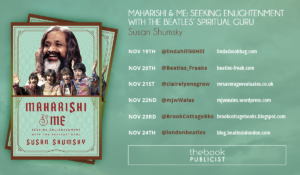 One of Maharishi’s lectures about the unity of nature and mankind touched John and Paul deeply, inspiring “Mother Nature’s Son” by Paul, and “Child of Nature” by John. “Everybody’s Got Something to Hide Except Me and My Monkey” consisted of Maharishi’s favorite expressions and portrayed meditation experiences. John said the “monkey” was Yoko Ono. “Revolution” originated from Maharishi’s philosophy that the only way to attain world peace is for individuals to achieve peace through meditation—not political revolutions. Six feet tall, with crew cut hair and dressed in white, Richard A. Cooke III (Rik) was the textbook Ivy League American jock. On a jungle safari, Rik and his mom Nancy Cooke rode an elephant that drove tigers into a kill zone, where Rik shot it in the head. The Beatles happened to be in Maharishi’s bungalow when the hunters described their tiger kill. Terry Gustafson, originally from Tucson, AZ, was a Ranger in Sequoia National Park. A bitter divorce drove him to LSD, which he took weekly for six months—enough to realize drugs weren’t the answer. Terry came across John Lennon outside the lecture hall in Rishikesh. Terry was dressed in short hair and khakis. John wore a flowing paisley cape, Indian shirt, red sash, white bell-bottom pants, and green Egyptian slippers with curled-up toes. His hair was dyed five different colors. Strobe lights built into his eyeglasses flashed on and off. “Look at you!” “Look at me!” John exclaimed. “One of us don’t belong ‘ere. Get back to the forest! Get back to Tucson Arizona! Get back where you belong!” After that, John often told Terry to “Get back!” when their paths crossed. This was how “Get Back” was conceived. When Paul heard loud crowing in the early morning, he wrote “Blackbird.” Years later he ascribed the song greater significance, claiming it was about a female African American in the Civil Rights Movement. Paul wrote “Why Don’t We Do it in the Road?” after he saw two monkeys copulating. It occurred to Paul that people’s sexuality should be natural, simple, and free as animals. One day at breakfast, Beach Boy Mike Love helped Paul with “Back in the USSR,” with its Beach Boys sound. Mike suggested the mention of girls from Moscow, Ukraine, and Georgia. George’s “Long, Long, Long” was about tears shed in losing and finding God. His “Sour Milk Sea,” written in ten minutes one evening in Rishikesh, promoted the simple process of TM as the way to overcome dissatisfaction and limitation. The fiftieth anniversary of the release of the album The Beatles (a.k.a the “White Album”), which the Beatles wrote in Rishikesh, is on November 22, 2018.